After a few rather cold, below freezing nights, we decided to drive south and west. That brought us to West Memphis on the Mississippi River and warmer weather. The next move gets squeezed between nice weather and a huge storm from the west. 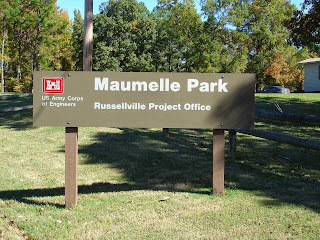 We head for a great COE park , Maumelle, in Little Rock, Arkansas on the Arkansas River. 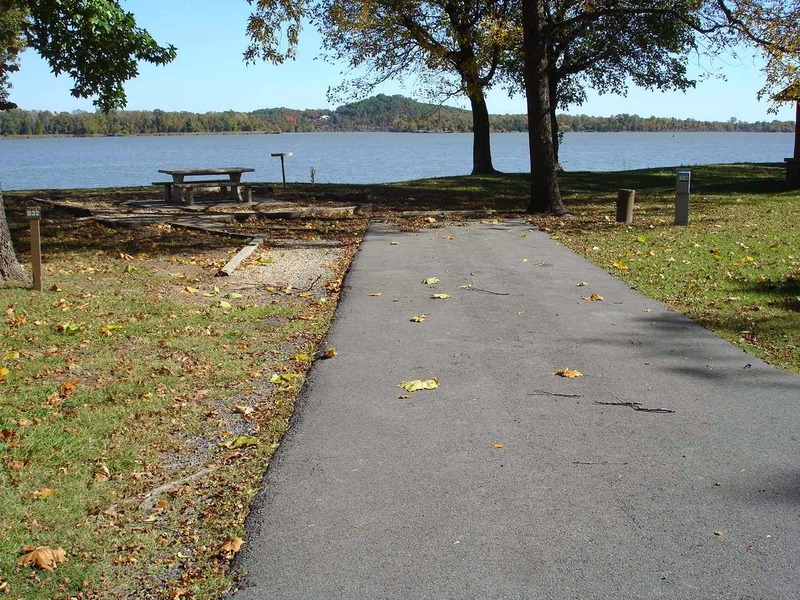 This is a large, pretty park with lots and lots of space for campers and groups, and boaters. Once again, we get to use our America the Beautiful Senior Pass for half price camping fees. That means we stay here for $11 per night with a water and electric hookup site. Jan and I are quite happy to know that the parks are now open. This park, as well as Ives Run in Pennsylvania( we had to skip), as well as all other national parks and campgrounds were shut down for 16 days in October. Again, Jan and I were listening to stories from other campers and the park workers about the shutdown, loss of jobs, and some very trying situations. These wonderful office work campers had to put up with visitors yelling and cursing at them because they had to close the park. Obviously not the worker's fault. 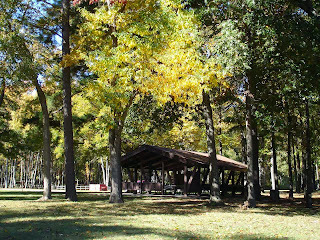 They also indicated that they had to ask 90 campers who were here enjoying the park , to leave when the park shut down. By the way, it was not the campers yelling at the workers. In this case it was a number of day visitors from the area. 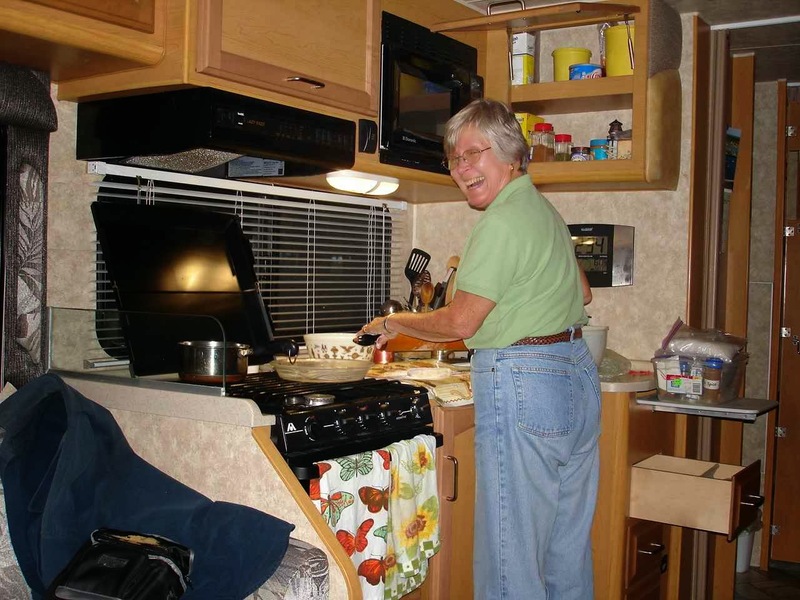 Many of us who are traveling campers are quite happy to have the federal parks open again. It was quite nice to settle in to our site here. 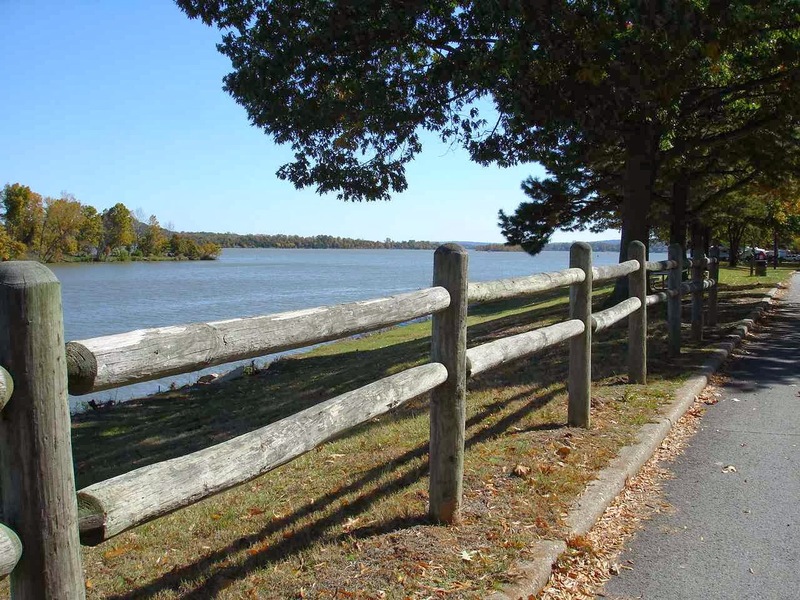 There are a number of fantastic sites right on the water, but these are reserved way ahead of time. 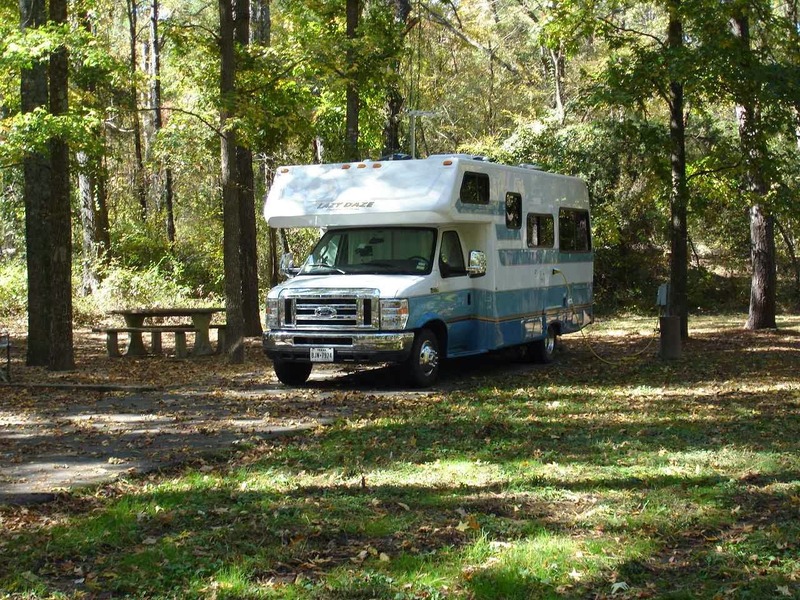 We are happy to take a spot in the back of the campground in the non reservable E section. 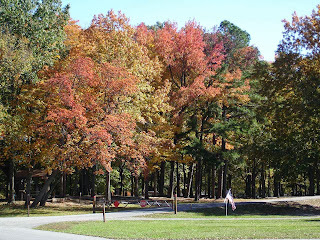 There are some nice colors in the park. 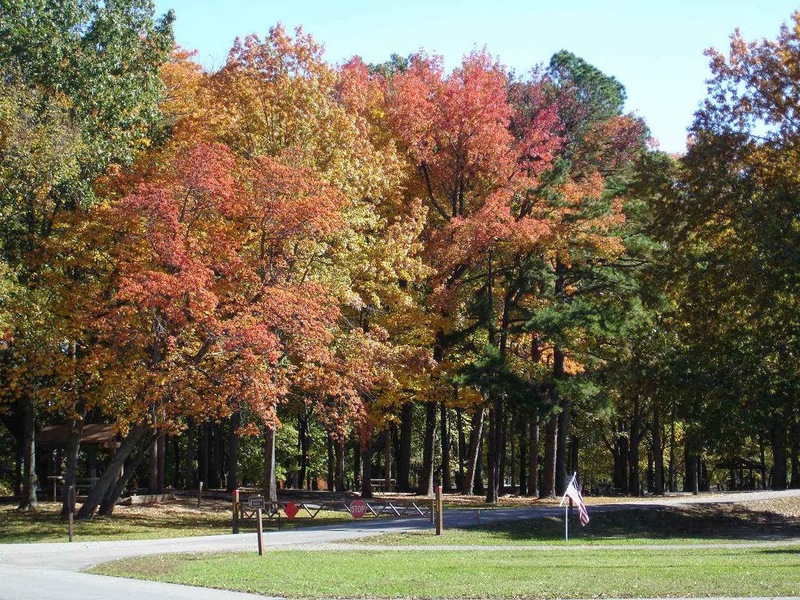 We know from previous visits that Arkansas can have some beautiful fall colors. It turns out that we are in a good spot for the weather. We do get all night rain, but we do not get the 12 inches of rain that fell in Austin, Texas--not that far south of where we are---or the tornado weather that happened in northeast Arkansas. This is the only park we have seen that offers this. Campers who are visiting Little Rock for medical treatment may reserve or sign up for about 10 or so spaces reserved for medical patients. They are charged $12 per night, but they get a full hookup site for as long as they need. The office indicated that the current sites were all filled and there was a waiting list. All of the current campers are here for cancer treatments. What a great idea. We don't know if other parks offer this. We do know that Escapees in Livingston, Texas offers camping right at their Care facility in the park . 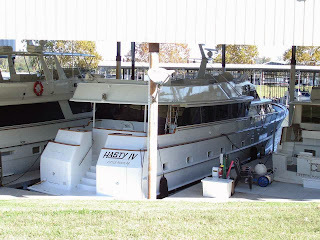 At the park is also a full service marina with spaces for many boats. Although it is right next to the park and accessible from the park , it is a separate business with a separate vehicle entrance labeled Little Rock Yacht Club. I guess these little row boats might qualify as yachts? Some of the newer ones like this one make us want to use the adjective "sleek". The Arkansas River starts in Colorado and travels through Colorado, Kansas, Oklahoma, and Arkansas to become a major tributary to the Mississippi River. The Corps of Engineers manage a number of locks, dams, and public use(camping,picnic, boating)areas along the river. The sites along the water are quite inviting. Maybe we need to plan ahead sometime to reserve one of these. 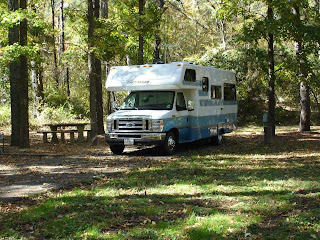 But, our site is quite comfortable with nothing but woods behind us and lots of room on both sides. 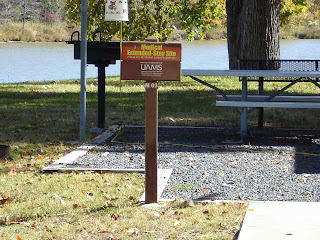 We have a list of nicely reviewed Corps parks along the Arkansas River and at a few of the lakes in Arkansas. 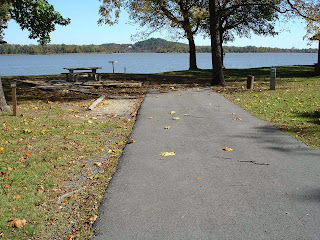 There are also some well reviewed state parks that we plan to visit beginning with Petit Jean State Park, a little north and west of Little Rock. But meanwhile, we are giving in to the temptation to stay an extra day in the wonderful fall weather. 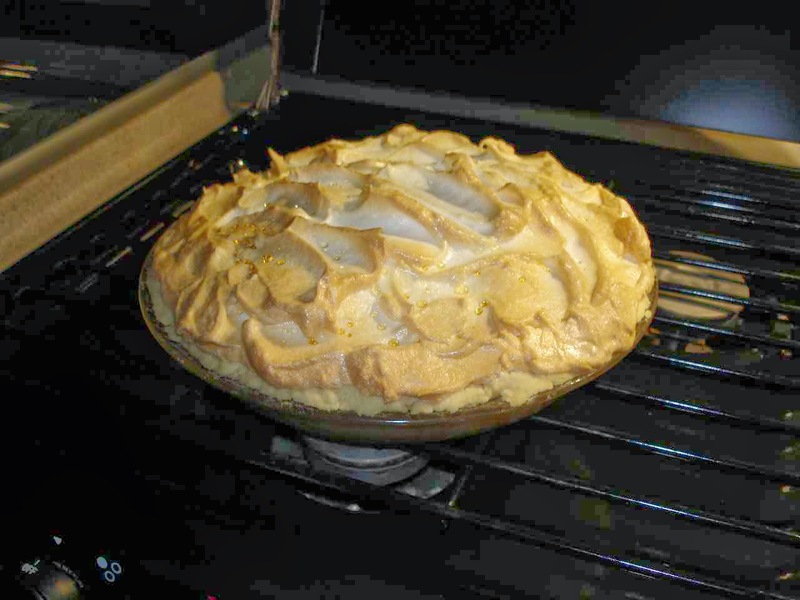 And what better way to warm Lady Blue but to have Jan bake a fresh from scratch lemon meringue pie. Are we lucky or what? Wow!! We have to wait 4 hours???? ?